Effective reading instruction in first grade .pdf version - Presented by Steve Stahl at the 2002 Michigan Reading Recovery Conference. 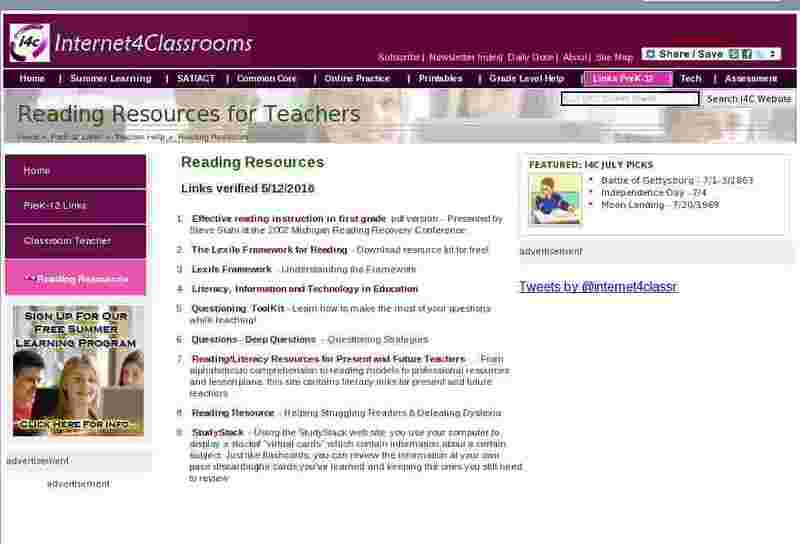 The Lexile Framework for Reading - Download resource kit for free! Questioning ToolKit - Learn how to make the most of your questions while teaching! Reading/Literacy Resources for Present and Future Teachers - From alphabetics to comprehension to reading models to professional resources and lesson plans, this site contains literacy links for present and future teachers. StudyStack - Using the StudyStack web site, you use your computer to display a stack of "virtual cards" which contain information about a certain subject. Just like flashcards, you can review the information at your own pace discarding the cards you've learned and keeping the ones you still need to review.